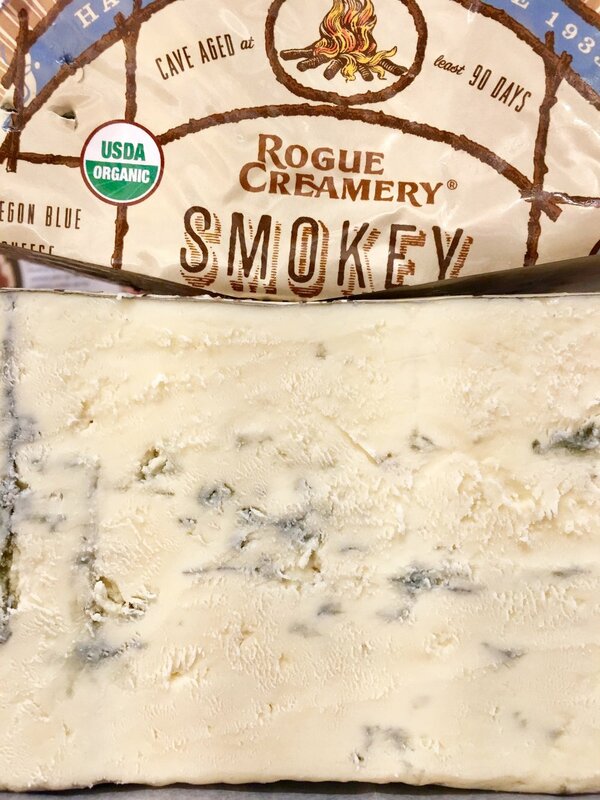 This week I'm all about Shah-mokaaay Blue (aka Smokey Blue from Rogue Creamery). Tom Vella founded Rogue Creamery in the Rogue River Valley in southern Oregon during the 1930s and he started making blue cheese in 1954 after a visit to Roquefort, France. He used his creamery to make great cheese, but also to create jobs in this rural area during the Depression, in WWII when women needed work, and then after WWII when the soldiers came home. Even when Rogue Creamery was passed down to his children and then sold to David Gremmels and Cary Bryant in the early 2000s, the mission has remained the same – be a productive member of the Rogue River Valley and make delicious cheese! Today, David and Cary have won all sorts of awards for various blue cheeses, including Smokey Blue. They cold smoke the cheese over hazelnut shells from Oregon for a rich smoke, and then age it for a least six months. It really tastes like candied bacon with the balance of smoky, salty, and sweet. I polled the Cheese Shop crew about what they might want to do with this glorious blue, other than eat it straight off the wedge, and everyone agreed it would make a killer blue cheese dip with wings. Or for something lighter, it would be the star in an arugula salad with candied pecans. However you choose to eat it, I think you’ll be happy. And Tom Vella lived to be 100, soooo I think that proves it’s good for you, too.